A new app can predict the likelihood that a patient will develop an incisional hernia following abdominal surgery, using big data to potentially help address a problem effects one out of every eight of these surgical patients. Researchers at the Perelman School of Medicine at the University of Pennsylvania developed the app utilizing electronic health records (EHR) to identify the most common risk factors for patients, as well as which surgeries most commonly result in incisional hernias across multiple specialties. They validated the app based on data from almost 30,000 patients. John P. Fischer, MD, MPH, FACS, an assistant professor of Plastic Surgery, will present the app and its development today at the 139th American Surgical Association Annual Meeting in Dallas, Texas. Incisional hernias occur after abdominal surgery at the site of the surgical wound when the contents of the abdomen can push through the muscle. They look and feel like a bulge under the skin at the site of the scar tissue, and they weaken the muscle, can be painful for patients, and usually enlarge and become more symptomatic over time. Further, many patients who develop these hernias end up needing an additional surgery to correct them, opening the door to further risk of complications and potentially leaving people caught in a cycle. Research from Fischer's group shows that care related to incisional hernias costs the United States health care system about $7.3 billion each year due to the number of these cases and the quality of life issues they cause. "Our tool presents the risk for each case at the point of care, giving surgeons and patients the chance to consider this outcome ahead of time and incorporate data into the decision-making process," Fischer said. Fischer and his team analyzed the EHRs of 29,739 patients undergoing intra-abdominal, urologic, or gynecologic surgery at Penn between January 2005 and June 2016. 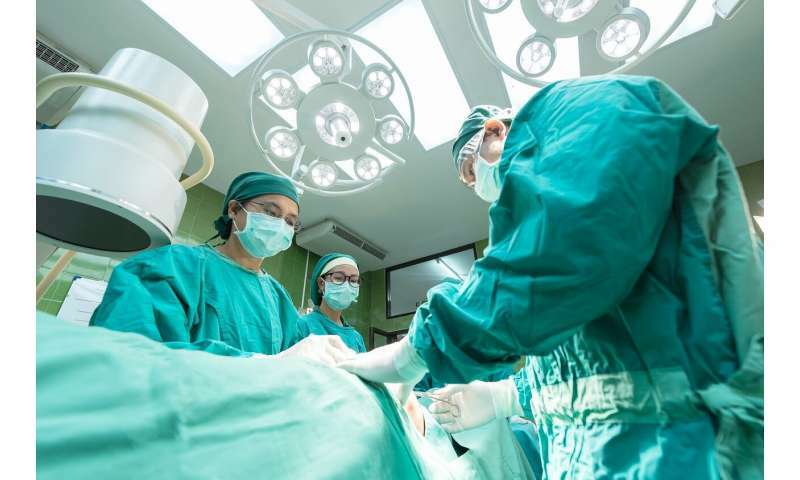 They found more than 1,100 of these patients (3.8 percent) ended up requiring a second surgery following the primary operation to repair the incisional hernias. Colorectal surgeries were the most common specialty associated with incision hernias (7.7 percent of cases), followed by vascular (5.2 percent), bariatric (4.8 percent), and transplant (4.5 percent). The analysis also identified risk factors that made a patient more likely to develop an incisional hernia. The most common was a history of abdominal surgery, which increased the likelihood in 87.5 percent of cases. That was followed by a history of smoking and a recent infection (75 percent for both). Obesity was also a significant risk, though it was weighted less than other factors. The app combines all of this data to generate a real-time risk score for each patient, and the model has proven to be remarkably strong. Reliability is a measure for which 0.5 is a coin flip and a 1.0 is a certainty. This model scores as high as .89. The ability to predict risk is one of several initiatives Fischer's team is working on to better tackle the impact of incisional hernias. Others include understanding patient expectations going into abdominal surgeries, as well as patient reported outcomes afterward. Fischer's team previously developed a tool to assess these factors, and he says combining them with the ability to predict risk gives surgeons a multi-pronged approach to addressing the issues related to incisional hernia care.